Operation Cast Lead was launched on December 27, 2008, as an Israeli response to ongoing and prolonged rocket fire by Gaza militants on the western Negev and Gaza vicinity communities. In mid December, the ceasefire agreement between Israel and the militant organizations in the Strip, which was brokered by Egypt in June of 2008, came to its end. Almost immediately, Hamas and Islamic Jihad's military wings resumed their fire on southern Israel, subjecting the area to incessant Qassam, Grad rockets and mortar shell fire. Prime Minister Ehud Olmert urged the Palestinian people and Hamas to put a stop to the violence, but to no avail. Foreign Minister Tzipi Livni's pleas to the international community to pressure Hamas into halting its fire, did not yield results, and the same came of Cairo's attempts to reinstate the armistice. The decision to launch the operation was made in the week prior to it, as Olmert and Defense Minister Ehud Barak agreed on the need to launch a wide-scale military offensive in Gaza. The National Security Cabinet approved the proposed operation unanimously. 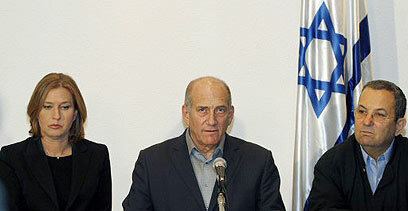 The Israeli government then employed several tactical measures, including misinforming the press of the cabinet's moves and allowing humanitarian aid into the Strip despite the ongoing rocket fire, in order to lead Hamas into a false sense of security and ensure the operation against the Islamist group would take it by complete surprise. Hamas, which had its members go underground fearing Israeli retaliation to the rocket fire, believed the Israeli media's reports suggesting an operation was days away, and ordered its men out of hiding. Operation Cast Led began on 11:30 am on Saturday morning, as IAF fighter jets pummeled Hamas offices, strongholds and infrastructure in northern and central Gaza. The offensive caught Hamas completely off guard. Carried out as two separate strikes, the IAF had 80 jets, warplanes and helicopters drop over 100 bombs on dozens of targets across the Strip. Hundreds of Hamas operatives were killed in the initial strike, which unfortunately, also claimed the lives of some of the Strip's civilians. 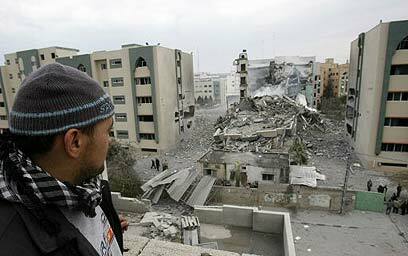 Among the targets hit was the police compound in Gaza City, which was completely destroyed. The Gaza City port and several security installations were badly damaged. The operation's second day saw the majority of the underground weapon smuggling tunnels along the Philadelphi Route destroyed; and within four days, 500 targets were destroyed, including two-thirds of the Strip's rocket launching pads. Once the operation was launched, Defense Minister Barak ordered a "special situation in the home front" be applied to the Gaza vicinity communities, giving security forces special municipal jurisdiction over the area. The order initially included all communities within a 13-mile radius of the Strip, but by the operation's fourth day it was expanded to include Ashdod and Ashkelon – 25 miles from Gaza. The Home Front Command and the Education Ministry ordered all the schools in the area to remain closed until such time as the operation was over. The operation, said Barak, has three objectives: Dealing Hamas a forceful blow, fundamentally changing the situation in Gaza, and bringing the rocket attacks against Israeli citizens to a complete halt. "I don't want to mislead anyone. This won't be easy and it won't be short, but we must be determined," he said. "The time has come to act. We will not let terrorists hurt our citizens or soldiers... We have no intention of allowing this situation to continue." 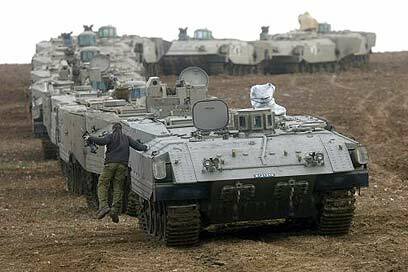 Preparing for all options, including a possible ground incursion, the IDF mobilized tanks and artillery batteries to the Strip and reinforcing infantry troops in the Gaza region. The defense establishment drafted about 6,700 IDF reserve soldiers, in preparation of the case the Knesset's Foreign Affairs and Defense Committee ordering an even wider operation. Aware of the dire situation in Gaza, and despite the ongoing military operation, Israel did not stop humanitarian aid from crossing into the Strip, allowing truckloads of medical supplies and food through the Kerem Shalom crossing, and pumping fuel and cooking gas through the Nahal Oz terminal. Egypt sent aid as well, in the form of Red Crescent trucks, which entered Gaza through Rafah Crossing. The militant groups in Gaza continued to fire at the western Negev and southern Israel, launching dozens of rockets a day. The operation, launched in the midst of an election campaign, prompted all three big political parties to announce they would be halting their campaign efforts pending the operation's conclusion. “On this day, we are all the IDF and we are all residents of the western Negev,” said Knesset Speaker Dalia Itzik. “There is no room for politics and we all need to unite behind the Israel Defense Force and the defense establishment." The operation's eight day saw the cabinet approve a ground incursion into the Strip. On January 3rd, after a day of aerial shelling and artillery fire on terror strongholds in Gaza, IDF infantry and gunnery forces, backed by the IAF fighter jets, entered the Strip's north, with the declared mission of destroying terror infrastructure. The Government approved an additional draft of thousands of reserve soldiers. According to the IDF, more than 50Hamas operatives were killed in the first day of the ground incursion alone. The international community, however, was quick to condemn the Israeli offensive in Gaza, with only the US stating that while it urged Israel to do everything possible in order to avoid harming civilians, it sanctioned its right to protect Israeli citizens against Hamas terror. The UN Security Council called for the immediate halt of all violence in Gaza, and a top UN human rights official called the Israeli response to the incessant rocket fire "disproportionate." On January 1, 2009, the UN Security Council approved the Gaza Strip ceasefire resolution by a 14-0 margin; the United States abstained in the vote. Notably, the word "Hamas" is not mentioned in the document at all. UN resolution 1860 "Stresses the urgency of and calls for an immediate, durable, and fully respected ceasefire, leading to the full withdrawal of Israeli forces from Gaza." However, the text only requires Israel to fully withdraw from the Strip after a complete ceasefire goes into effect in the area. However, both Israel and Hamas declared the resolution invalid, with Olmert deeming it "unworkable" and Hamas slamming it as bluntly favoring Israel. On January 17, the 21st day for Operation Cast Lead, one week after the UN decision, Israel declared a unilateral ceasefire. The decision followed a National Security Cabinet meeting, in which seven ministers voted in favor of the decision, two objected, and one abstained. The cabinet did, however, ordered some troops remaining Gaza while arrangements are made to prevent Hamas from rearming.